Now that I think about it, I've spent a fair bit of time on twitter lately. 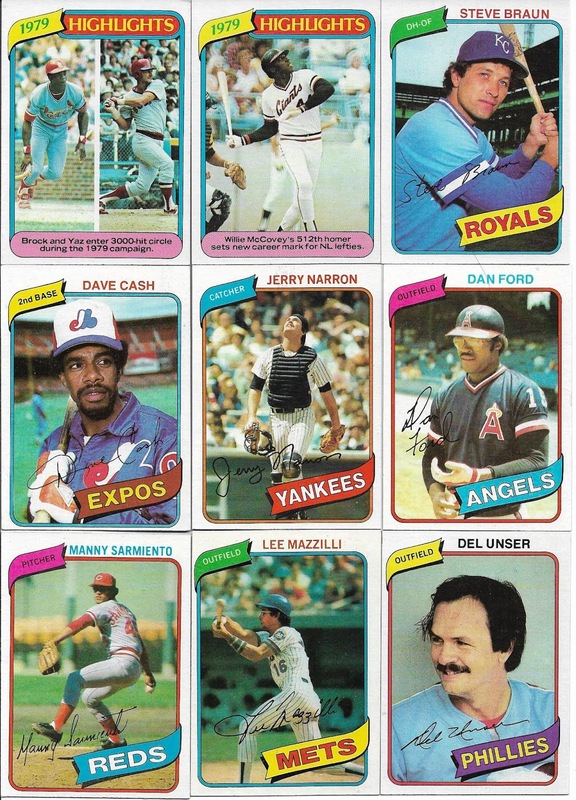 I'm following a lot of card collectors on the site, trying to keep up with all the collections and great cards that are pulled, traded and won on a daily basis. A few weeks back I started following an account that many of you likely know, the One Million Cubs Project. 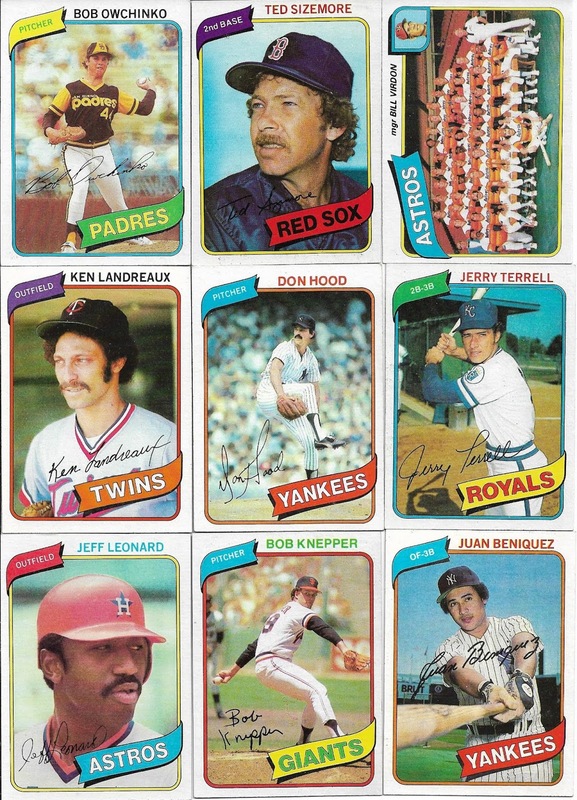 Beau tweeted one day that he had a bunch of 1980 Topps cards that were available for anyone that was putting together the set. I resembled that remark, and quickly sent him a DM with my want list. Beau really hit the mark, sending me 135 cards from my want list, which is down to a very manageable 53 cards to go. 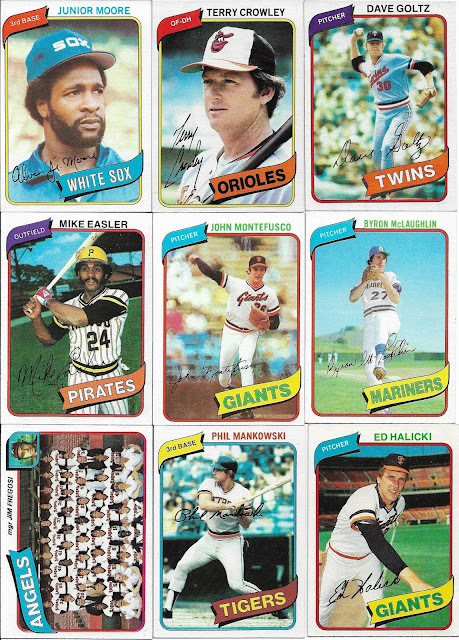 The only real "hurdle" is the Rickey Henderson RC, which I've seen in several places for less than one week's spending money, so finishing this set off soon should not be an issue. 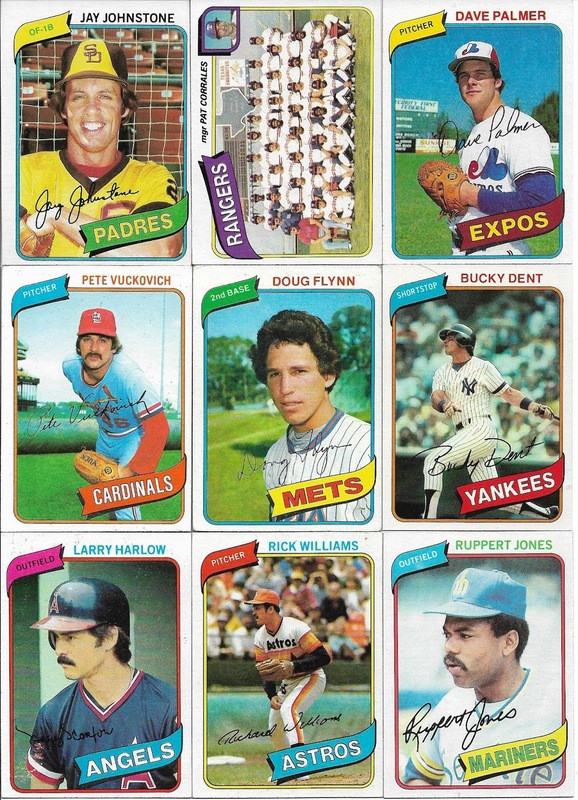 Still get a kick out of seeing cards with old style uniforms such as the black White Sox, pinstriped Pirates, and the original Mariners uniforms. 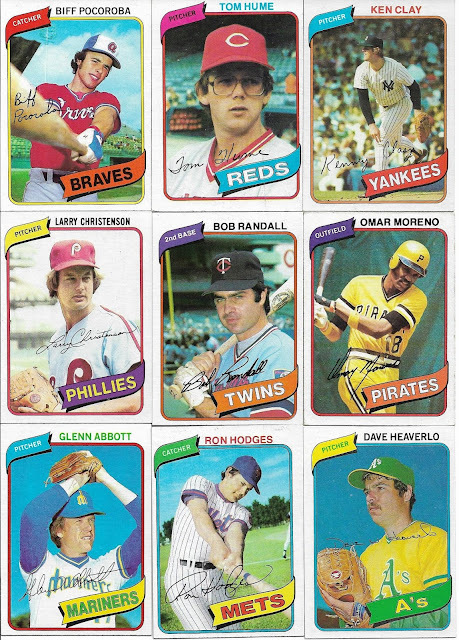 The very first card in the top scan might be the best of the bunch; I had no memory of both Yaz and Brock reaching 3000 hits in the same season. The card states that they were the 14th and 15th to reach that milestone, that number has now more than doubled to 32. One last little tidbit regarding this package. It traveled a few more miles than it should have. It started in Wisconsin, and was headed to South Florida when it made a left turn and wound up in Charleston, South Carolina. That's about 550 miles from where I live, and that was on the day it was supposed to arrive (last Saturday). I decided to request text updates to my phone to see how it was going to progress from Charleston to my house. I received one text that afternoon that the package had moved to Columbia, SC. Two more texts on Sunday showed the package first in West Palm Beach and then Opa Locka, FL. Thank you Beau for the cards, they really are appreciated!! I always wonder why the USPS has certain packages take the scenic route. I guess as long as the package arrives safely... it's not the end of the world. Swing and a foul tip?